Berliner Philharmoniker; Claudio Abbado, conductor. The dynamic capabilities of your surround music system will be amply tested with this performance of Mahlers Symphony No.5. It was recorded in Berlin in May of 1993 and just transferred to DSD this year. The source material was originally 44.1kHz/24-bit PCM and the surround mix was created by Gernot von Schultzendorff. The sound is fully up to date, though, and the surround mix is tasteful but deliberate. The performance is paced quickly and the surrounds are used to capture the frenetic energy contained therein. However, its the dynamic range on display here that makes this a terrific test for your system. The full weight of the orchestra comes to bear in resoundingly clear, full-range sound. Dont just expect bass from the LFE track of this 5.1 recording, either; your mains and surrounds had better be up to the task or youll lose some impact and dynamic shadings important to the performance -- not to mention that you might blow the drivers in your speakers! There are a number of manufacturers of two-channel components that have crossed over into the land of multichannel audio. But trying to predict the audiophile markets quirkiness in order to know exactly what to produce to compete in the multichannel realm surely keeps the folks at these companies up at night. Take, for instance, the subject of multichannel power amplifiers. Many of the early examples were based on a fixed number of channels, whereby companies assumed they knew the configuration of their customers systems. More prevalent today, however, are modular designs that can house any number of channels based on the customers actual, not perceived, needs. Audio Research has released such an amplifier platform in the 150M. This component type is a good hedge against obsolescence and insures that an upgrade path exists for customers who do not want to sell off equipment to buy the newest model only to obtain more channels. 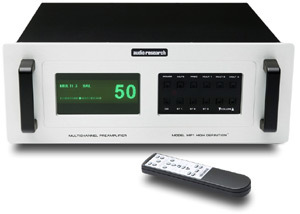 Audio Research's MP1 multichannel preamplifier ($6995 USD) offers a similar level of flexibility. First and foremost, the MP1 is a fantastic two-channel preamp. Inserting the MP1 into a reference-level stereo system does not show it to be more about function than sound quality -- Audio Research made sure the MP1 could hold its own in a high-end two-channel system. That should come as a relief for those audiophiles who assume that they have to sacrifice absolute performance for system flexibility when delving into multichannel sound. In fact, you might just like the MP1 better than the preamp you have now and never take advantage of its multichannel capability. The flexibility of the MP1 is without peer in my experience. 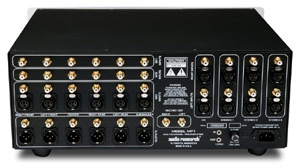 There are three sets of six-channel RCA inputs with one of those sets duplicated with XLRs. There are also four stereo inputs, all of which give you the choice of either balanced XLR or single-ended RCA connections. Outputs consist of two banks of six-channel connections: one set using balanced XLRs and one set of single-ended RCAs. Rounding out the facilities are a 12V remote trigger, an IEC power-cord connector, and RCA record outputs. Any of the multichannel inputs can be designated Processor, thereby giving an external component the responsibility of controlling the systems volume level. This function is better known as a home-theater bypass or a unity-gain input because the volume control of the preamp is disabled in favor of another component's, usually a receiver's or processor's. Individual channel levels can be adjusted so that each channel is in balance with its peers. The rear panel of the MP1 contains a huge number of connectors to be sure, but Audio Research has not skimped on the quality of these parts. Each gold-plated input and output jack is fastened securely to the chassis. It always worries me to see jacks that simply jut from a chassis opening, because that typically means they are connected only to the circuit board housed inside the chassis. Im always afraid that inserting an unusually tight RCA plug will rip the jack from its anchor point on the board. Youll also have enough room between each jack so that you wont have to squeeze cables together to make them fit. The MP1s rear panel is an example of robust build quality and excellent layout -- a combination rarely seen in multichannel components. If you like the appearance of Audio Research preamps (who doesnt? ), youll like the look of the MP1. It is a large component (19"W x 7"H x 15"D), but the moderate weight (a few ounces over 20 pounds) makes it easy to manage. The front-panel style is classic Audio Research and available in either natural (silver) or black finishes. Handles are optional as well, and will run you $70 the pair. The front-panel controls are accessed via a bank of pushbuttons displayed across two rows on the right side of the chassis. Each button -- volume up and down along with input selectors -- is replicated on the remote control, too. The most dominant feature on the face of the MP1 is the bright-green display, which is easily the largest, most conspicuous Ive ever seen. I cant imagine anyone having a problem seeing the volume setting from across the room or in any lighting condition. The numerals are a full 1" high! This is a welcome change from what Im used to seeing (or not seeing, as the case may be). There are six brightness levels to tailor the display to your taste, or you can turn the display off altogether. Speaking of the remote control, its a small plastic job that is easy to use and quite functional, although it doesnt have the heft that you feel when theres a metal case. Id like to see Audio Research offer an upgraded, more Fritzian remote for people who like a weighty feel. As for the electrical design, Audio Research states that the MP1 employs "pure class-A circuitry" and is "fully balanced in a double-differential design, utilizing all-FET circuits with unity-gain buffers between stages and a double-buffered output." Exactly how I would have done it! I used the MP1 with a variety of components and in a variety of system configurations, but all within the same room. It was typically fed multichannel inputs from either an Esoteric DV-50 or Lexicon RT-10 -- both universal audio/video players. I also used the balanced stereo inputs with the DV-50s balanced outs to ascertain the MP1s two-channel performance. The MP1s home-theater bypass was also used with an NAD T 743 receiver. Speakers were Wilsons (X-2 Alexandrias, Sophias, and a WATCH Dog Series 2) or Paradigms (five Studio 100 v.3s arranged in an ITU-style configuration). Amplifiers were models from Coda Technologies along with a Blue Circle BC206. Several Shunyata Research Hydras provided power conditioning, and cabling was from Nordost. The Audio Research MP1 is a neutral-sounding preamplifier. Using its balanced inputs and outputs, I was able to confirm this with recordings such as Simon and Garfunkels Old Friends [Columbia C3K 64780]]. The MP1 displayed vocal clarity that made the performance of these two icons both intimate and human. I could hear no veiling or tonal abnormalities on "Mrs. Robinson" or "My Little Town" that would rob the music of its humanity. This test came as quite a relief; if the MP1 could not pass a basic test of male vocals, would its multichannel performance even matter? Not to me, or, I suspect, anyone else spending seven large on a preamp. With a solidly rendered, transparent midrange under the MP1's belt, it was time to move on to some multichannel material. Norah Jones Live in New Orleans DVD is quite good for a DVD-Video concert with a Dolby Digital soundtrack. Although it lacks some weight and tightness youd likely hear from a DVD-Audio or SACD version, there is good ambience to listen for and a number of low-level sounds to separate from the mix. The MP1 managed to let through the crowds gratitude and enjoyment without losing any of the sounds to the noise floor. The vocals were, again, neutral, but not harsh or biting. The soundstage was well focused and not unnaturally large; the sound was simply pleasant, as it should be with this disc. Going from pleasant to frenetic, the MP1 ably handled impressive dynamics while displaying clarity and three-dimensional soundstaging across all channels. A 1993 reading of Mahler s Symphony No.5 (Berliner Philharmoniker; Claudio Abbado, conductor [Hybrid Multichannel SACD, Duetsche Grammophon 477 071-2]) showed the MP1s strengths to be multifaceted. There was no tube-like warmth or rolled-off highs or lows -- a decidedly good thing if you like your music presented with the full range of elements intact. If youre expecting a solid-state preamplifier that sounds like a 70s tube amp, look elsewhere. The MP1 served Mahler with superb clarity. Time to 'fess up: The Orpheus Labs Two ($6720), my long-time-reference multichannel preamp, and the Audio Research MP1, are virtual sonic equivalents. Initially I had a hard time telling them apart, which led to much consternation on my part. I put these two units through a litany of A/B tests over the audition period just to differentiate the pair, and this finally paid off. Over time a couple of characteristics did surface, and they helped define the two. The Orpheus Labs Two is slightly quieter than the MP1. It has an ever-so-slightly lower noise floor that makes notes float in space unimpeded. This is a very important sonic strength in my book and one that has helped allow the Orpheus Two remain my favored preamplifier for almost two years now (and that means with two-channel material, too). The ARC MP1 is no slouch in this regard, mind you, but it does have just a hint more intrinsic noise that can become apparent in low-level listening. The MP1 countered with a musically significant strength of its own. It bettered the Orpheus Labs Two in the ability to track dynamic passages with all of the drama and fluctuation present. It took me a while to hear this, but what became clear to me was that the MP1 was able to let go of the notes quicker, thereby not robbing the music of its life and vibrancy. Transient response was sharp as a tack, and it was quick and agile no matter what type of music I played. Both of these preamps sound so neutral, though, that I would feel I was cheating you by not pointing out an obvious fact: both offer top-tier sound. I can count on one hand the number of preamps I think are better, and those are only two-channel-capable units. All isnt equal when the total package is taken into account, however. The Audio Research MP1 trumps the Orpheus Labs Two with both its well-thought-out display and sheer input/output capability. The Two has a tiny display that I have to strain to see from twelve feet away (with 20/15 vision! ), whereas the MP1s readout could be spotted from a low-flying plane. Perhaps this is not a pivotal feature for a minimalist preamp controlling a two-channel system, but for a multichannel enthusiast who also enjoys stereo listening and home theater, system functionality and the ability to shift settings and inputs on the fly are key. The Orpheus Labs Two is a physically small component, and that alone will attract a fair number of users. It also limits just how much real estate is available for inputs and outputs. The Orpheus brain-trust has managed some mighty slick engineering to counter this limitation. Theyve made the Two programmable by letting the user convert a series of stereo inputs to an additional set of multichannel inputs. What they could not do was include balanced outputs for all channels. The ARC MP1 uses to its advantage a large back panel for all of the inputs and outputs you could ever want -- and plenty of space to access each one. At the time of this writing, Orpheus Labs does not have North American distribution, a fact that made me pause when an audiophile friend asked me to suggest a transparent multichannel preamp. If the Audio Research MP1s sound alone were not enough to supplant the Orpheus Labs Two as my recommendation, its ready availability -- from a renowned company, no less -- and outstanding functionality would likely push it to the top. The fact that its sound is so good makes it a no-brainer. The MP1 is the multichannel preamp to buy, and the one Im recommending to friends. I cant make it any clearer than that.